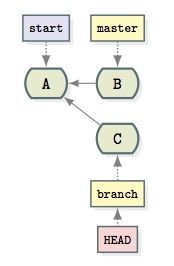 I have a (large) commit tree that contains several merge commits that I want to rebase to another commit. Doing a normal rebase causes git to ask me to resolve merge conflicts. I didn't want to review each merge, because this would be a lot of work. After finding out about the --preserve-merges option, which is neatly explained here, I thought I found the perfect tool for this task. However, I cannot seem to get it to work properly. I have created a toy example that demonstrates the problem. Starting from an empty folder, we first create a branch with a merge and another branch on which we will rebase. 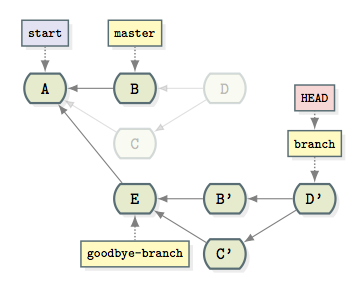 Where master refers to B, branch refers to D and goodbye-branch refers to E.
git commit -m "Create Hello.txt (commit A)"
git commit -am "Change to Hello World (commit B)"
git commit -am "Change to Hello Dave (commit C)"
git commit -m "Merge branch master into branch (commit D)"
git commit -m "Add Goodbye.txt (commit E)"
What am I doing wrong? I would expect git to be able to use commit D to resolve the merge conflict it encounters while rebasing. I am using Git 1.9.4.msysgit.1, which is the most recent version right now. The --preserve-merges flag simply tells git-rebase to try to recreate merge commits instead of ignoring them. 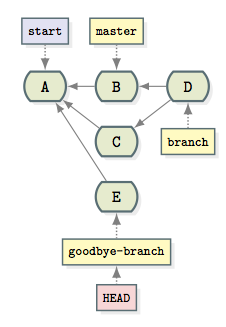 It does not give git rebase the ability to remember how merge conflicts were resolved, i.e. it does not record conflict resolutions for future use. What you want to use for that is rerere. 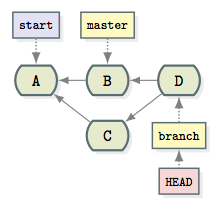 In your toy example, the conflict arising during the rebase is exactly the same as the one you resolved during the preceding merge. If you had activated rerere before the merge, you wouldn't have had to resolve that conflict again during the rebase. If you anticipate that you will merge, then rebase a branch, you should activate rerere so that, in the future, you only need to resolve a given merge conflict once, not multiple times. Let's break down your toy example. You resolve that conflict by overwriting the contents of Hello.txt with Hello World, Dave!, staging your changes, and completing the merge commit. Then Git attempts to create merge B' and C', but a merge conflict arises for the exact same reason as the first merge conflict you experienced: Git has no way of figuring out whether the Dave line should go before or after the World! line. Therefore, the rebase operation grinds to a halt, and Git asks you to resolve that merge conflict before it can complete the rebase. 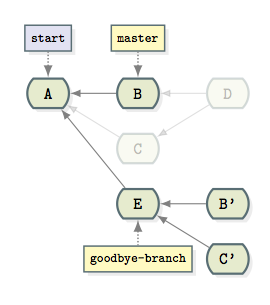 Git's rerere is your friend, here. The name stands for "reuse recorded resolution" and as the name implies, it allows you to ask Git to remember how you've resolved a hunk conflict so that the next time it sees the same conflict, Git can automatically resolve it for you. [...] if you want to take a branch that you merged and fixed a bunch of conflicts and then decide to rebase it instead - you likely won't have to do all the same conflicts again. before the merge, then Git would have recorded how you resolved the merge conflict when creating commit D, and would have applied the same resolution when it encountered the same conflict during the subsequent rebase. The conflict would still have interrupted the rebase operation, but it would have been resolved automatically. All you would have had to do is git rebase --continue. However, it looks like rerere wasn't already activated before the merge, which means Git must have kept no record of how you resolved the conflict the first time. At this stage, you can either activate rerere now and resolve all those same conflicts manually again, or use the rerere-train.sh script (see also this blog post) to use the existing history to pre-seed the rerere cache. Why does the same conflict reappear when I use git rebase?